We spent 862 BILLION dollars – actually $3.27 TRILLION when you factor in interest and the cost of extending all the programs Obama created – on what even Obama now admits was a completely bogus premise. Now all we have to wait for is for Obama to realize that his other “success” – ObamaCare – was a dismal failure at best, too. The president gave that remark in an hour-long interview with the New York Times. When the president campaigned for the stimulus package at the start of his presidency, he and others in his administration repeatedly insisted the investments would go to “shovel-ready” projects — projects that would put people to work right away. As recently as August, however, local governments were still facing delays spending the money they were allocated from the stimulus, CBS News Correspondent Nancy Cordes reported. Couldn’t help but laugh at the way Obama phrased a couple of things. He says he “should have ‘let the Republicans insist on the tax cuts’ in the stimulus, rather than including them himself, so the package would have seemed more like a compromise.” Because appearances are everything, aren’t they??? And if we’d just pitched it this way, and given Republicans just a tiny little bit of input, then maybe we could have blamed yet ANOTHER liberal-created mess on Republicans. And “comes across as “the same old tax-and-spend Democrat.” Do ya THINK??? 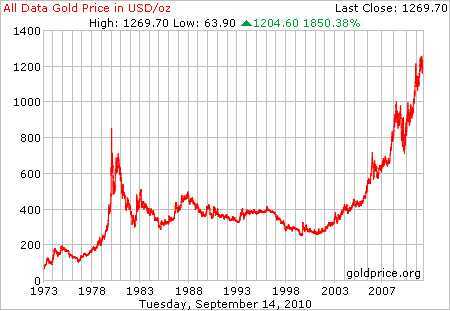 Gold reached the highest constant-dollar value ever recorded during the last year of the Carter administration. Adjusted for inflation, that is a much better price than the new all-time-high we just saw today under Barry Hussein. By the time Obama leaves office in utter disgrace, you can rest assured that gold will be in the stratosphere, as desperate investors look for anything that Obama can’t ruin. Enter that old Carter “malaise,” that old Carter “crisis of confidence,” as the American people finally come to realize that their president knows less about how the economy works than most of them know about brain surgery.